Managing a Physician Practice is quite different than managing a hospital yet the lines between independent physicians’ practices and hospitals are blurring. Polaris can provide visibility into physician performance data and peer to peer analysis as an effective management tool. Improving physician quality indicators means improving patient care and outcomes. Simplify your healthcare management efforts with a consolidated view of the levers that drive patient satisfaction, time savings and revenue collection. Polaris’ consolidated dashboard shows appointment statistics, office visits, financial metrics and wait time for appointments will give insight across all practices in one place. Optimized patient throughput, proactive patient care, improved patient and physician satisfaction. Armed with next available appointment data, Polaris will help identify bottlenecks and leakage points so you can take action. Proactively aligning the services provided with the demand for services will help close coverage gaps, lower costs and improve revenue. Close care gaps by proactively monitoring patient demands/needs with healthcare provider services and skills. Using physician leaderboard reports, you’ll show physicians how they compare with data that is specific to the practice or their peers. Consolidated data and reports that are meaningful and concrete helps the physicians identify weaknesses within their practice and begin the conversation on opportunities for improvement. 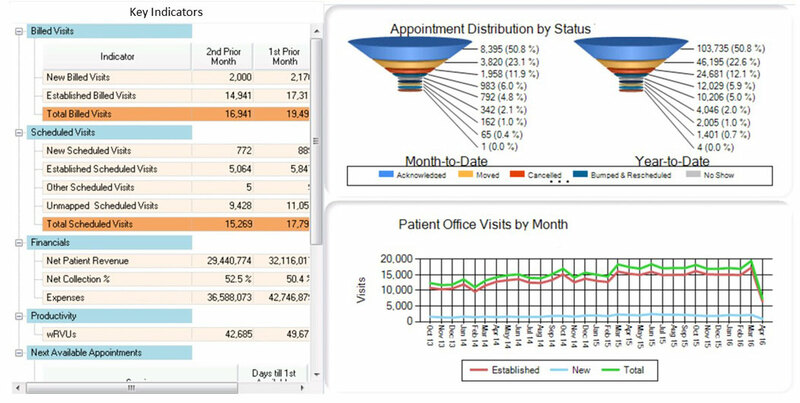 Enhancing physician awareness through POLARIS’s customized insight reporting is key to performance improvement. Managing a collection of physician practices means juggling a myriad of disparate systems and healthcare data points. Polaris can easily automate and consolidate the data for ease of reporting and analyses. We’ll extract data from multiple sources, customize it into a centralized dashboard for viewing and refresh the data daily for accuracy. Keep it Simple with Polaris by eliminating confusing reporting and customizing the view for optimal performance.